In July, I had a divine appointment with a leader at a citywide pastors prayer gathering in Kansas City. He began to share with me his heart for prayer and passion for transformation. He had recently been given a copy of “Desperate for His Presence” by a Nazarene pastor who had attended the “Awakening Conference” in Ft. Worth last year. As he shared his heart and their story I realized the Lord was really preparing these leaders and I agreed to visit their community to encourage them and see what was going on. A couple weeks later I drove down to Pleasanton, Kansas. This is a very small, rural community. One main street with a bank and post office and a couple streets of businesses surrounded by residential neighborhoods. I found the church by driving through town. It was refreshing and reminded me of the community where I was raised as a little girl. But it was also filled with hopelessness and you could see the remnants of the community that used to be but now was only a small shadow as many people had moved away. Spiritually it felt like a “ghost town” as many small rural communities in our nation do. But in the very middle of the town was a small Nazarene church whose pastor God had set on fire at the “Awakening Conference”. When I arrived I expected to meet with a handful of pastors. When I arrived however the room was packed with about 25 people! I realized immediately that this wasn’t going to be a “usual” first meeting to share vision! They were FULL of vision! They were desperate for God! They were in relational unity after praying for 6 months and they were demonstrating deep humility. Those are the characteristics that God loves and responds to so I grew more interested in what was going on. 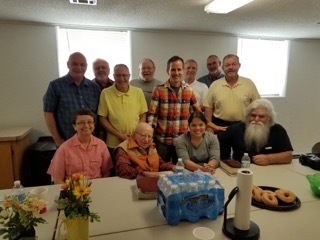 For the past 8 months or so pastors across Linn County had been meeting to pray in various communities and a hunger was spreading for revival. I shared that day for almost 3 hours – 2 hours beyond their normal meeting time and I only left then because I had to drive back to Kansas City. By the end of the first meeting they committed to the journey of transformation no matter what the cost – they were ready! I left that day stunned at how quickly God can move when leaders are so obedient to pursuing His presence. Over the past couple of months their prayer times together have transitioned from praying for revival for their community to just being with Jesus together and establishing deep foundation vertically with the Lord as a team. The results have been amazing! They are so blessed and going so much deeper in prayer together and connecting to God’s heart. God has been showing exciting signs of His presence in the community as well. Each time I speak to one of the pastors the excitement of the personal revival they are in is contagious! It feels like a rumbling just under the surface about to explode. In a couple of weeks we are having a transformation seminar in the county to release a vision for transforming revival and the pursuit of God’s presence at every level – in their hearts, their homes, their congregations and community. We are expecting mighty things! Pastors that have pastored for decades sense this is the most anticipated time of their ministry career. God is up to something in Linn County!